Built in 1933, currently owned by the City Government of Silay and used as the cultural and tourism office. This entry was posted on July 28, 2006 at 4:26 pm	and is filed under Ancestral Houses, National Heritage Houses, Negros Occidental. You can follow any responses to this entry through the RSS 2.0 feed. You can leave a response, or trackback from your own site. Makes me reminisce the time I was growing up in Negros 40 decades ago. I’ve just started my blogsite yesterday–www.zylla3.wordpress.com and I would surely come back to this site. It makes me wonder how I missed looking at this amazing architecture. I guess when you are a young Silaynon, you tend to takes things for granted. Great website. Everytime i look at this picture,i remember the happy and lovely times we had here with my cousins. miss ya all!!! 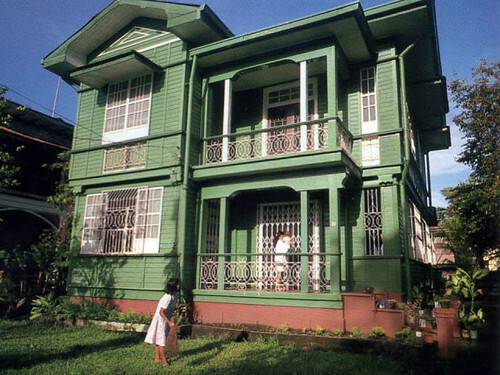 Silay is one of the precious town in the province in terms of ancestral properties, culture and peaceful environments. As one of the SILAYNON I am very proud and looking forward for greater future of my HOMETOWN. so please help me find a good lot which is not a crowded place to live.. it must be nice to live near the sea and near school. hope to get back you soonest reply and wish we could be apart of your community bieng a good citezen.